I've covered a fair number of Art of Trance tunes so far, and I generally enjoy the overall discography of British producer and label headmaster Simon Berry, their quality really does range, with his most recent productions being a bit of a disappointment in comparison to what I know he is capable of delivering. In discovering that, in a change of pace, he collaborated with two other producers in 2014, their influence might have brought about some positive change. 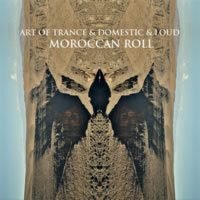 With Israeli psytrance artists Domestic and Loud at his side, could there truly be magic in this Moroccan Roll? Wait, what kind of an artist name is "Loud"? ...I guess that's one way to describe yourself. First on the docket is the Original Mix, and it starts out ominously, with echoing Indian brass in the background of a seemingly emptied subway platform before Art of Trance's typical 303 bass weaves its way in. That 303 slowly builds up from a low rumbling to an angrier growl, and it's pretty pleasant on the ears, actually. Strange acid worblings also flitter about before we get to the main event: a honk. No, just kidding, there's actually some underlying trance padding afoot, which, though nice to listen to, isn't really substantial to form any melody beyond a mild backing soundscape. This tune relies more on filtered pads and the psytrance-like rumbly bass to form its roots. Overall, this is a pasture of harmonic sound, rather than anything melodic. It would have been nice to have a solid melody in place, but instead, it's the mildest, safest psytrance on the block. Though pleasing from an aural perspective, Moroccan Roll is lacking in filling. The ON3 Remix dares to be different enough that it could very well be its own track, while still pulling enough influence from the original to still be considered a remix. Compared to, say, Firebird, it definitely has a little more kick, but... we need MORE kick. Soundscapes are fine, but knowing what Art of Trance was doing 20 years ago, songs like this feel like a regression.